The 10 X 10, Orford Summerhouse is a large, spacious and just high class all the way type of place to relax and really enjoy some quiet time. 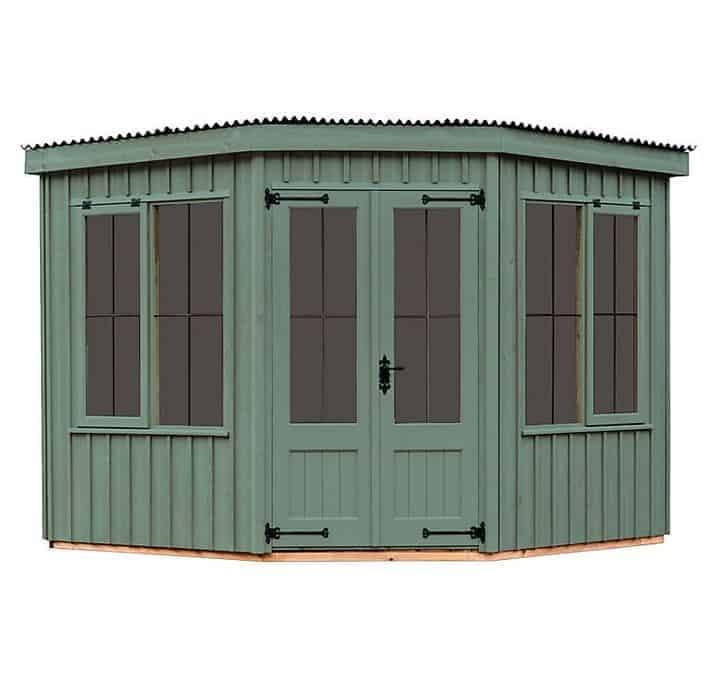 With a classic design and made from some of the finest materials such as, Scandinavian Redwood, corrugated roof sheeting and toughened glass, the Orford Summerhouse is a place where you will be able to enjoy yourself for many years to come and also impress the neighbours when they peek over the fence. 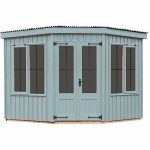 The old school style sawn cladding and pent style corrugated roof certainly give the summerhouse a look that sets it apart from all the rest. 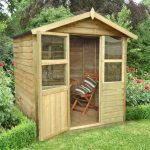 As well as keeping the elements at bay because of the well thought out design and materials, the Orford Summerhouse comes with a great set of double doors complete with mortice lock to make it certain all your belongings will be safe. 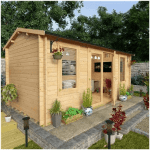 This is a summerhouse that certainly makes a big and positive impression in any garden. The Orford Pent Roof Summerhouse certainly does have a very impressive stature and at an incredible, 9 feet 8 inches in both length and width, you will have more than enough room available to you to create your own little slice of heaven in your garden. Scandinavian Redwood is what the summerhouse is mainly made from and we love this kind of wood as it looks and feels great, but it is also incredibly strong and will last many, many harsh winters. One thing that we really like about the design of the summerhouse is how Crane have made it so there is a lot of headroom when you are inside. At the lowest parts of the summerhouse, you have roughly six feet and at the highest section there is actually a little over seven feet. The vast amount of space inside here really does mean that you can lay out this summerhouse any way you want and that is something we think is just fantastic. The roof is perhaps more than anything else what really gives the Orford Summerhouse its charm. This pent style, corrugated roof certainly catches your eye as it is just so unlike what is the norm these days. The pent design will ensure that rain will always run off the back and never sit, soaking into the roof. To make sure that corrugated roof stays where it is supposed to, Crane have used 19 x 125 mm tongue and groove boarding. The Scandinavian Redwood that they are made from is more than up to the job of keeping the roof secure. So that you do not have to look at the roof boards when you are trying to relax with a nice glass of wine and perhaps your favourite music playing, Crane have added in this lovely, pine effect tongue and groove ceiling. One of the most interesting design choices of this summerhouse is the cladding. 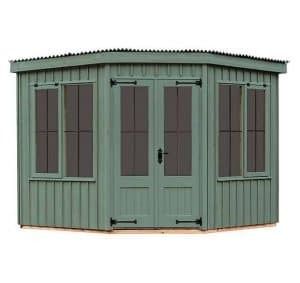 To really make this a summerhouse that has its own kind of style, Crane are using this very cool looking, sawn cladding which first of all will see the rain, snow or whatever else our weather throws at it just bounce right off and stay outside. At 12 x 150 mm and made from Scandinavian Redwood, the cladding not only looks great, but it also will last a lot of years. One more thing that has been done that really adds to the overall look is the 16 x 38 mm topping that has been added. We really like the way this topping makes the whole summerhouse just stand out that little bit more. Behind a good looking exterior there should always be a strong and reliable frame and we could not be any more pleased with the frame that ties this all together. Once again like the rest of the summerhouse, Crane are making use of that fantastic, Scandinavian Redwood to make sure that this is a frame which is going to keep its shape and stay good and strong. The dimensions of frame are 19 x 50 mm and this really does offer just an amazing skeleton for the summerhouse. We have no doubt that even a decade after being built that this frame will be just like it was the day Crane came and installed it. We have had the displeasure of walking into more supposedly top of the line summerhouses that have a high price tag and then have a cheap floor that we would have liked to over the years. Well we could not be any more happy to tell you that the floor here is good and strong. 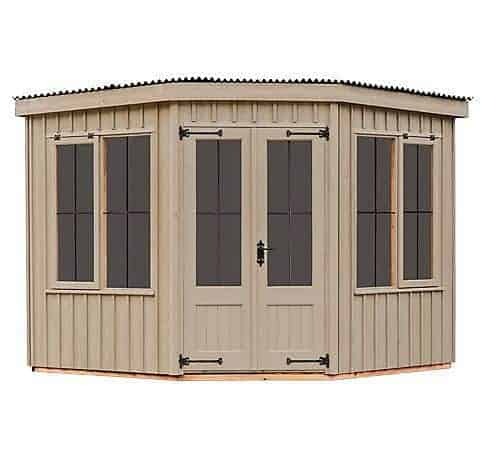 Made with the same 19 x 125 mm boarding that the roof is, you have a floor here that is going to be able to handle your chairs, tables and anything else you plan on decorating your summerhouse with. Some 38 x 50 mm floor joists are used to help give the floor a little bit more backbone and ensure that the flooring will remain strong for a lot of years. While the Orford Summerhouse is built by Crane’s team of expert installers and of course they are using top of the line materials, you still need to roll your sleeves up and treat the summerhouse once it has been built. This will make sure your summerhouse lasts you many years and it is actually pretty fun to do as well. 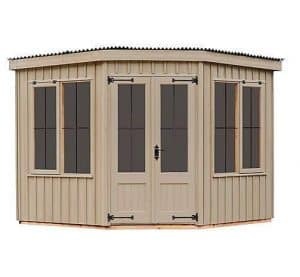 Crane have a warranty that will cover you in case of any wear or tear that may occur to the summerhouse. 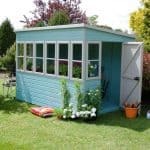 While you of course will have a spot in your garden all picked out weeks before the summerhouse arrives, Crane will actually work with you and offer advice on if that spot is suitable. If you choose not to take their advice then your warranty may not be valid. The doors on the Orford Summerhouse are really quite amazing and they are one of the more attention grabbing features that the summerhouse has. At 1830 mm wide and 1100 mm high, we are having a hard time actually thinking of anything that will cause you any headaches trying to get inside here. We know that no one wants to have to start twisting things up on their side or getting in weird positions just to get them inside and thankfully that is an issue you will not have. Cast iron Fleur-de-Leys hinges are what is used to hold the doors on and also give the summerhouse just a little bit more style. These hinges are joined by a door handle and lock which are done in the same design and colour and it really does give the doors a high quality look. There is a window on each of the doors, but there are another four on the front of the summerhouse. 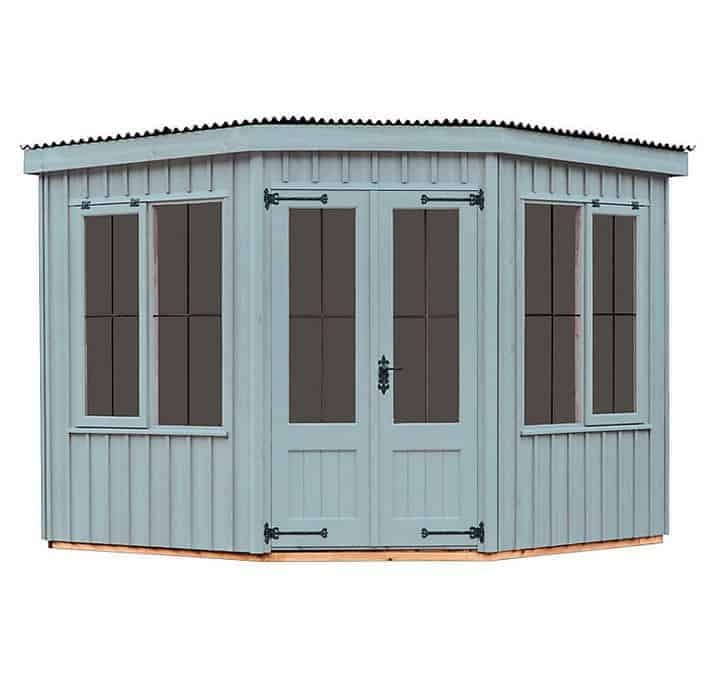 Having six large windows all on one side does give the Orford Summerhouse a very inviting and friendly kind of look. These windows are just as high quality as the rest of the building. Made with toughened glass which is 4 mm thick and they all have a very classy looking lead cross. As well as offering a lot of light inside, two of the windows open so you can also get a nice breeze in here if the wind is just right. 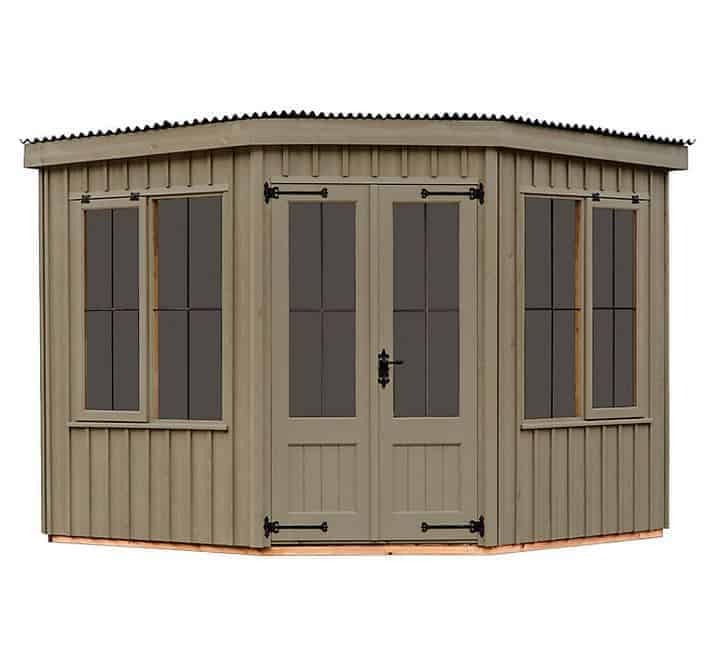 A summerhouse this great should have some very cool stuff inside so with that in mind, Crane have included a very reliable, strong and secure, mortice style lock so that you can keep your summerhouse locked up at night and when you are not home. We feel this lock offers all the security you need. Anything with six windows does have the potential for a lack of privacy, but we think the windows look fantastic as they are. Still if you do want to cover up then a set of blinds or curtains if the right style could make for a nice little addition. 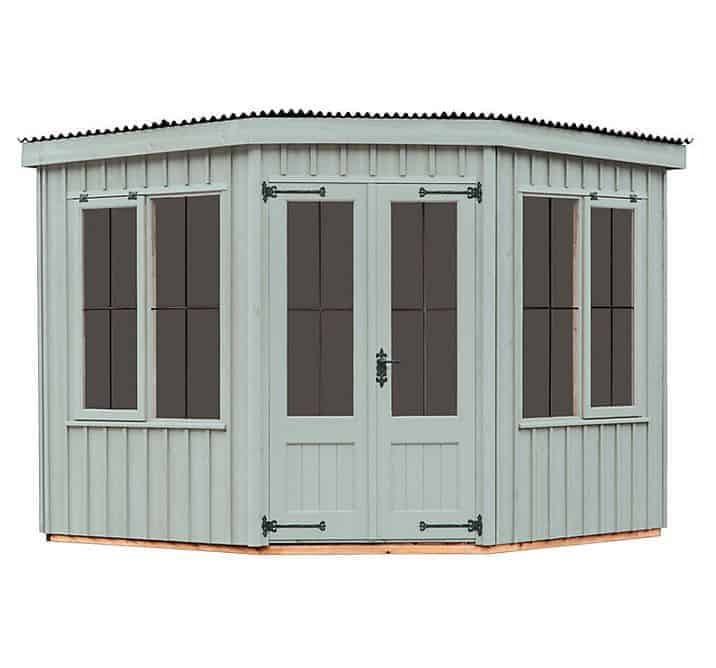 Crane have a very good selection of colours that you can choose to have your summerhouse painted in. There is a good variety ranging from a more natural tone like Dome Ochre to something that stands out a bit more like, Terrace Green. As well as these two colours there is also, Wades Lantern, Earls Grey, Disraeli Green and Painters Grey. Crane have really gone above and beyond in every regard when it comes to the overall quality of the Orford Summerhouse. Every aspect of the summerhouse has clearly been carefully planned and built to the highest standard. The selection of materials is something that we are very impressed with. From the Scandinavian Redwood to the corrugated roofing. Everything that makes up this summerhouse is designed to last for a lot of years. 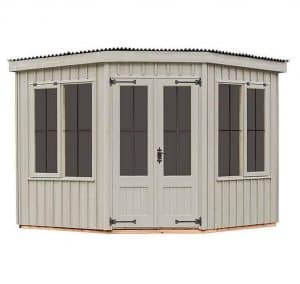 This is the largest summerhouse in this range and honestly if you want to go all out and make sure that you can design the inside exactly the way you want then the size on offer here allows for that. One of the great things about dealing with Crane is that they will install as well as deliver. Sure it may take a while, but at the end of the day at least you will sleep better knowing that people who knew what they were doing built your summerhouse. Look we know that your eyes may bulge the first time you see the £6,295.00 price. 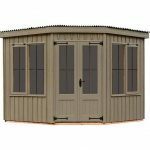 But we do feel that because of the huge size and the way the summerhouse has been designed that you are actually getting a lot for your money here. 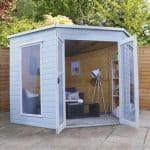 Plus this is a onetime investment as the materials will make it so this is the only summerhouse you ever need to buy. Final Thoughts: We think that it is near impossible not to be impressed by the Orford Summerhouse. Epic is a word that is way overused these days, but honestly, epic is the best way to describe this summerhouse. It is large, well built from the finest materials and it also looks amazing. 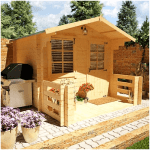 We say if you can accept the high price or are even willing to save up for a while, then make the purchase that this is a summerhouse you will be able to enjoy for a very long time.